This review is reproduced from the Reverb Music blog on DenverPost.com. Read the original here. 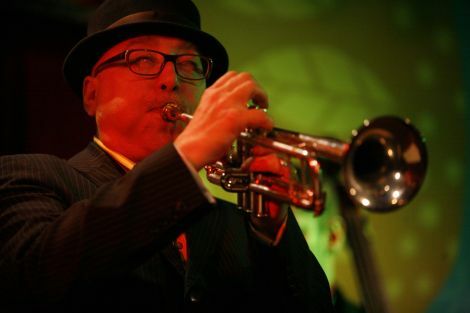 Grammy-winning trumpeter Brian Lynch loosens his lips during his set at Dazzle on Saturday. Photos courtesy of Al Hood. I’m guessing trumpet players get a bum rap sometimes simply because their instrument is one that can’t be ignored, resounding as it does in the topmost register of the brass woodwind family. There are the stereotypes about how trumpeters are self-centered, too loud and have funny-looking “trumpet lips.” There are the jokes: What’s the difference between a trumpet player and government bonds? The bonds eventually mature and earn money. 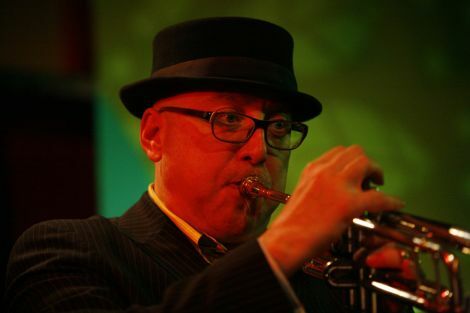 While I did not have an opportunity to speak long with trumpeter Brian Lynch after his show at Dazzle on Saturday night, his performance said plenty about his unselfish approach to music. 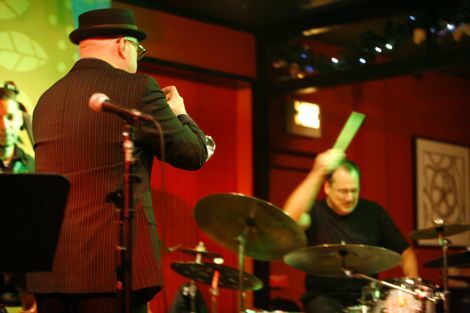 On a night when Lynch was in town without his band, it would have been easy for the Grammy-award-winning trumpeter to take over the show single-handedly. And, in no slight at all to Lynch’s prodigious talents, it would have been our loss. Thankfully, Lynch created spaces for his outstanding backing musicians from Denver: Jeff Jenkins on piano, Paul Romaine behind the drum kit and Bijoux Barbosa on bass. A dynamic interplay resulted, with Lynch pushing the tempo and the band feeding off the trumpeter’s bright tones. Lynch tore into his set with “Woody Shaw,” a cut from his album “Tribute to the Trumpeters.” In my opinion, Shaw was one of the greatest trumpeters of his generation, and it was a thrill to hear Lynch “play homage” in Shaw’s trademark angular style. “It Could Be” was a down tempo tribute to relatively unheralded trumpeter Tommy Turrentine. Jenkins added tension to the song with a piano solo that wheeled seamlessly from classical to “stride” to funk and blues accents so quickly it was difficult to track his trail. Lynch also called up a former student in the audience, pianist Ben Markey, to sit in and showcase his considerable talents. 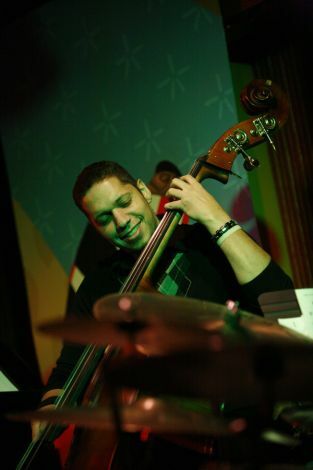 A cut from the Latin-fueled “Simpatico,” Lynch’s 2007 Grammy-winning album, gave Barbosa’s nimble style on the bass a chance to shine. “One for Mogie,” a song in praise of trumpet great Lee Morgan from Lynch’s forthcoming “Unsung Heroes” album, closed the night’s set in rousing style, with emotional swings reminiscent of Morgan and a wild interplay between Lynch and Romaine on the drums. The great aspect of Romaine’s playing has always been that it’s as expressive as it is aggressive, so it was great to see Lynch playfully crowd the drum kit with trumpet bursts, blurring the lines of a drum solo. Likewise, the encore featured Jenkins amazingly paraphrasing each of Lynch’s improvisational lines. I usually prefer jazz players who make more mistakes than Brian Lynch — that is, if Lynch made any. He’s a virtuoso who is now an accomplished composer, giving his listeners more insight into his own voice and the many things he has to say. If you look at the arc of his career, this seems to be the direction he’s moving. And don’t be surprised if that path includes more Grammys. Of course, this does not change the fact that trumpeters really do have funny-looking lips. Denver-based writer Sam DeLeo is a published poet, has seen two of his plays produced and is currently finishing his second novel. Photos courtesy of Al Hood, copyright 2008. This entry was posted on Wednesday, December 10th, 2008 at 6:16 pm	and is filed under Reviews.